In entries to Russian Federation, the migration card has been giving to foreigners. These migration cards are given to the ones which come to Russia by air, by sea, by railway Access and by land at the points of their entry to Russia. Migration cards are given to foreigners that make entry to Russia, by officers that are in charge in passport control, by filling out. Migration cards consist of two parts as entry and exit in A and B shape. No matter how old the foreigner is, it has been giving migration card for each foreigner. Upon the migration card the entry date to Russia must definitely be stamped in passport control. 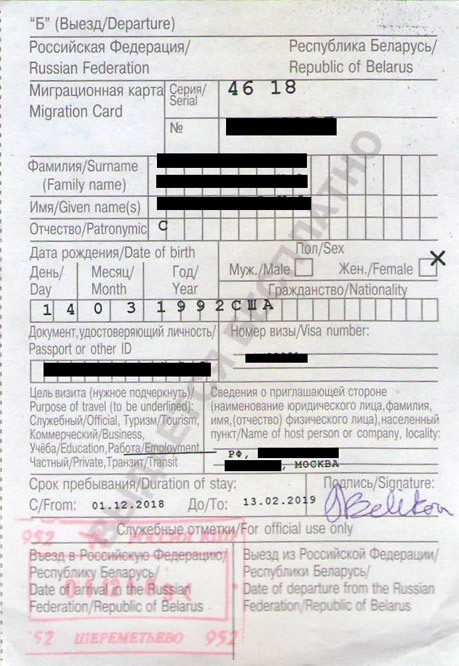 The entry to Russian Federation part (A coupon) of migration card which consists of two parts, is left in passport control. The part which is for exit from Russia Federation (B talon) is given to foreigner. The part which is for exit from Russia Federation (B talon) must be kept throughout the stay of foreigner in Russia and the foreigner must return this talon in passport control when he/she exits from Russia. If the foreigner loses its foreigner migration card it must apply to UVM within 3 days and take its duplicate migration card. In your entry to Russia, your entry purpose to Russia which is found in Migration card form, must be definitely written correct. That you have a Russian visa doesn’t mean that you can definitely enter to Russia, with which purpose is your Russian visa is given, you must state it correctly on the form or when it is asked. In passport control, your entry date and the name of airport through which you entered, has been stamped on your migration card, sometimes although rare they can forget to stamp, you check this as soon as you got your passport. Very important, Read definitely. Contact for your questions. İmportant migration cards usually are filled out by responsibles in passport control. Men will mark Муж, women will mark Жeн option. Your nationality. England or English. If you came on duty. Usually those that come with gray passport, namely those in whose visa “Служебный визит” is written, will mark. Commercial Visa. If you come to fairs or commerecial interview. Namely those in whose visas are written “Коммерческий визит” or “ Деловая”, will mark. If you come for study... Namely those in whose visas are written “Учеба” will mark. Private visa. If an individual has invited you, you can mark here. Namely those in whose visas are written “Частный визит” will mark. If you come with touristic purpose... In coming without visa namely those in whose visas are written “ Туризм” will mark. Those who come for working. If you came for working, but your company has brought you with commercial visa, mark ABSOLUTELY commercial visa.... You can mark here if Teknik is written in your visa. Namely those in whose visas are written “Работа” , “ Работа по найму “ or “Техобслуживания” will mark. Transit... This is for those who has to stay for a while in Moscow to go to somewhere else.